So the end of the world didn’t happen after all, but at least there is a second coming, just not the kind you might imagine. 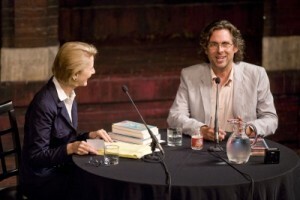 On September 10, 2007, Michael Chabon kicked off the 27th season of the Inprint Margarett Root Brown Reading Series, reading from his book The Yiddish Policeman’s Union—a mix between the detective genre and alternate history. He charmed us all with his dazzling wit and brilliant insight on writing. This year, he’ll do it again. Chabon will kick off the second half of the 2012/2013 Inprint Margarett Root Brown Reading Series on January 28, 2013, reading from his latest novel, Telegraph Avenue. Following the reading, University of Houston Creative Writing Program faculty member, Mat Johnson (author of Incognegro and Pym), will sit down on stage to interview Michael Chabon and talk about Telegraph Avenue. Before the reading, we thought it would be fun to look back at Chabon’s last visit. Here’s an excerpt from his 2007 on-stage Inprint interview conducted by Fran Fawcett Peterson.